Last week I went to Shin Kong Cinema to see the movie called “The Iron Lady.” The movie tells the life story of Margaret Thatcher, former British Prime Minister. Meryl Streep plays Thatcher in her middle and late years and Alexandra Roach plays Thatcher in the early years of her career. Jim Broadbent plays Thatcher’s husband, Denis Thatcher. Anthony Head is Thatcher’s cabinet member and deputy. Photo Credit: Alex Bailey / Courtesy of Pathe Productions Ltd. The movie starts with a scene where retired Margaret Thatcher buys milk at a neighborhood grocery store and walks home alone. Her husband died a while ago and now she is mostly alone. She has problems remembering things and is physically weak. She looks back on her personal and professional life thinking that her husband is looking back with her. Her story is told through flashbacks, memories of her past. In one of the flashbacks of her early years, she recollects how hard it was to be a lower middle-class woman. She worked at her father’s grocery store before going to Oxford University. In another flashback of her career she remembers her struggles being the only female member in the House. In flashbacks of her years as a Prime Minister she remembers moments with her deputy, Geoffrey Howe. Meryl Streep’s acting as Margaret Thatcher in her middle age and late years was astonishing. The actress completely transformed herself to act and sound like Margaret Thatcher. The way Meryl Streep behaved and did things was exactly the same of that of the main character. She spoke with the same accent too! Streep wore the same outfits and accessories and had same kind of make-up which Margaret Thatcher did. Therefore, I was very interested in the character’s life story while watching the movie. Of course, Meryl Streep’s performance was highly acclaimed. She earned Best Actress awards at the Golden Globes, the BAFTAs, and the Academy Awards. Meryl Streep’s make-up artists, Mark Coulier and J. Roy Helland, received Best Make-up Academy Awards. 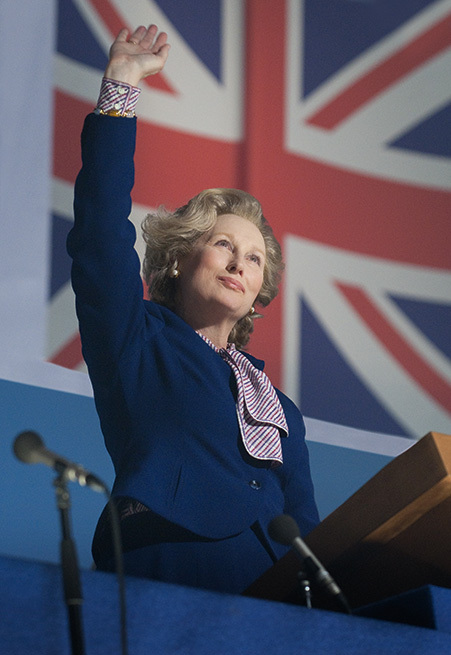 They created a perfect look of Margaret Thatcher for Meryl Streep. The make-up was so well done that I didn’t recognize Meryl Streep in the beginning of the movie! I enjoyed the movie and did not feel that it had lasted for almost two hours. This movie is great for students and young people beginning their careers. Margaret Thatcher’s life and accomplishments are great examples of hard work and dedication.